1960 McCall's #5426 vintage sewing pattern, teen separates, blouse, jacket, shorts and skirt, size 12s. 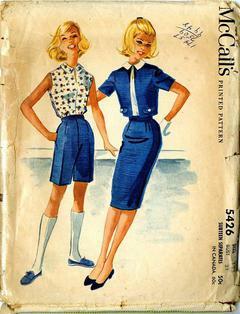 Sleeveless blouse, dart fitted Bermuda shorts, slim 3-gore skirt and collarless short jacket. Blouse has round collar, front neck opening. Lined jacket has fake pocket flaps, short set-in sleeves. Blouse, skirt and shorts have left size zipper closings.